How NEM performs against other top cryptocurrencies? What is NEM and how it works? NEM stands for New Economy Movement and it took the cryptocurrency world by storm as soon as it was launched in 2015. It gain popularity because of the innovative features that it brought to the blockchain system. Some of its remarkable innovative features are its Proof of Importance (POI) algorithm, encrypted messaging mechanism and multisignature accounts. NEM is an open source platform having XEM as its currency and it started off as a fork to NXT. This payment platform soon got its very own versatile codebase after the coders of the platform looked to rebuild the network from scratch. The beauty of the system is its ability to allow more than ledger to coexist over a blockchain. · The on-chain security implementation feature such as the smart assets and multi-sig takes the lesser decentralized nature of the platform in the background. · It comes with an easy to understand and lighter code. · It is highly secure as compared to many other crypto platforms. · It provides easier updates. · It is quick in completing transaction where its average is around 30 seconds. · Security is top-notch with this platform. · NEM lacks transparency and a lot of details about its finances are still not much clear. · NEM since its inception has not shown much improvement in its platform in terms of its technology. People are waiting for the claimed ‘Catapult’ innovative technology for a long time and nothing concrete has been seen since then. It wouldn’t be exaggerating to say that NEM is one of the finest decentralized application to have. It is more so because of its scalability which most of the other applications struggles with. If we consider Ethereum, then you can expect it to deliver 15 transactions at maximum in every 1 second. NEM on the other side can handle hundreds of transactions in every 1 second. NEM for sure has taken availability of the platform and its security very seriously which leads to far less technical problems over the network. NEM is known to use the code off the blockchain and that makes it a safer, faster and a very easy technology to entrust. Arguably, such setting makes it quite les decentralized. NEM or Ethereum just as discussed above are both inspired by the ideology of Bitcoin platform. NEM is known for having all the benefits of Bitcoin, and that too, way better than Bitcoin. So, NEM should easily be chosen over Bitcoin on any given day. NEM in terms of its growth, performance and preference by users surpassed Litecoin well over a year now. Litecoin today is struggling with its immensely high transaction fees and extremely slow rate of completion for a transaction. Allegedly, Litecoin nowadays is better than bitcoin, if we speak strictly on technical grounds. The prime reason for its slow response is its poor marketing, perhaps. NEM already is a great threat for IOTA and predominantly has been elbowing it to sit well above it in the market in terms of its market cap ranking. By the end of 2017, NEM had traded worth $125 million in comparison to just $25 million of IOTA. It looks like the success of NEM is mainly because of its unique method of Proof of Importance (POI) along with its fine API technology helping with the betterment of its decentralized apps and smart contracts. IOTA in its own space with non-blockchain based model with the Tangle (DAG) theory has its own set of benefits which you can find below in IOTA section. Moving on, NEM is very closely associated with Ripple (XRP) due to a lot of similarities in between them and both are quite popular to say the least. Ripple does its point scoring over NEM when we consider the protocol of the former which is entrusted by banks for transferring money worldwide and as well as by individual investors. Transactions are completed fast with fairly low transaction fee. Ripple has become the need for many banks as without their protocol, the international transaction fees could be very higher. NEM and NEO are rated equally by experts, but in future NEO is expected to go higher in value because of its very limited supply. China is a huge crypto market and NEO there alone is the market leader giving tough time not only to NEM but a number of other cryptocurrencies as well. However NEM is revolutionary with its technology and comes with highly secure network and beats NEO over the vulnerabilities it has in its model. The multisignature and the encrypted messaging is making things very much in favorable of NEM presently and also in the future to come. NEM again is preferable for its advanced technology and fully stuffed platform with various features to make a difference. Stellar in its own space is quite good. Stellar does its points scoring over NEM with its highly quick transaction completion time of just 5 seconds. Further, it has very low and negligible transaction fee as compared to NEM. From the investment perspective, NEM is good for long term investment, such as of 2 years in order to get a good return. Stellar has proven to be profitable over short term investments. Cardano for its current market value and return on investment potential is rated far above NEM. Cardano not too long ago released the 1.1.0 version of its software which addresses quite a few shortcomings in its code and somehow bridged the gap to some extent between NEM and Cardano in terms of technology infrastructure and performance. You can see their performance accelerating with their Proof of Legitimacy algorithm with which every transaction is completed. Each and every node in the Cardano network verifies the initiated transaction. This all comes at the cost of transaction completion speed being compromised where every transaction is completed in nearly 5 minutes which is too high as compared to 30 seconds transaction speed of NEM. WAVE provides a custom blockchain model which was primarily designed for some large scale business models. T has a decentralized model and facilitates numerous platforms such as financial instruments trading and crowdfunding etc. The platform is the first of its kind to be built over the Scorex framework. Yet, it has a long way to go before it has any chance to compete with NEM in terms of performance and technology. WAVE has a fairly low market cap at 58 million. It has got potential and the need is to market it well where its decentralized exchange should get more attention among the potential investors in the market. NEM is a good choice for investors for a number of reasons. The best part is its technological innovation and its transaction speed and acceptable transaction cost. 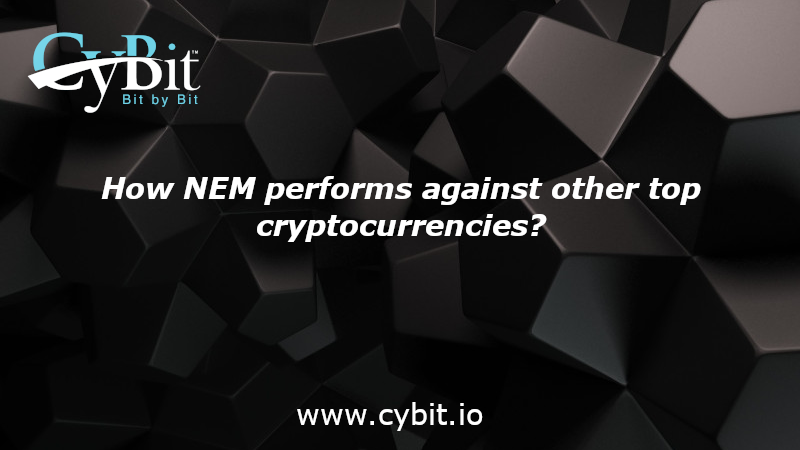 However, in the highly competitive crypto market, NEM is rated at number 10 by the experts in 2018. Still, it has got the potential and infrastructure to quickly make its way to the 5 cryptocurrencies very soon.